I had some butternut squash left over after making some vegan mac and ‘cheese’ or more aptly named mac and squash. I decided to bake something cake like. Always my preferred dessert, let me eat cake! 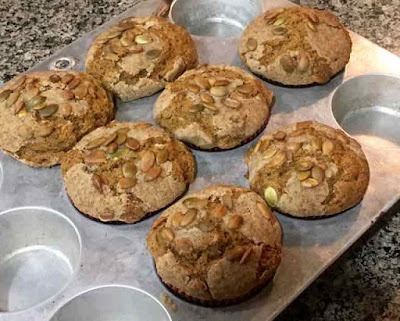 I converted a regular recipe for pumpkin muffins into a gluten free squash muffin version. I love how they came out. The texture is light and fluffy, yet denser than cupcakes. It is moist with delightful spices. The delicious crumb topping puts it over the top. 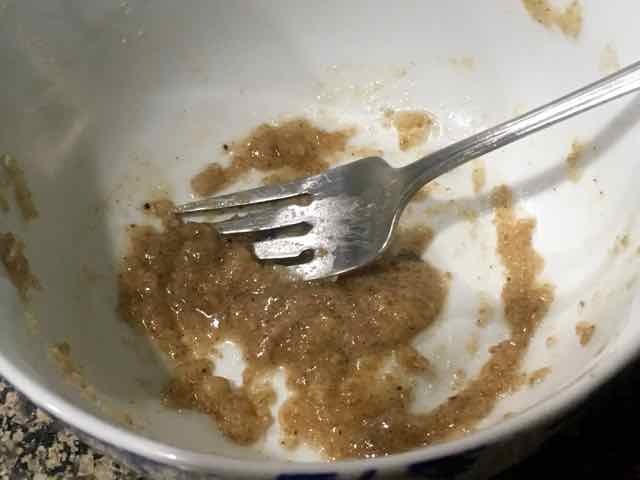 No electric mixer is needed with this recipe, a bowl and spoon will due. I made the cake part dairy free and then topped half of the muffins with crumbs made with butter and half with crumbs made with oil. To my surprise the taste was indistinguishable. Perhaps the spices in the crumb mixture covered up any butter flavor that might be noticeable if there were no spices. The texture was quite different though. The non butter crumbs melted over the top while the butter crumbs stayed crumbly. They both looked good enough to eat and tasted wonderful. Lately I have taken to substituting 1-2 tablespoons of coconut flour for some of the chickpea flour in my recipes. 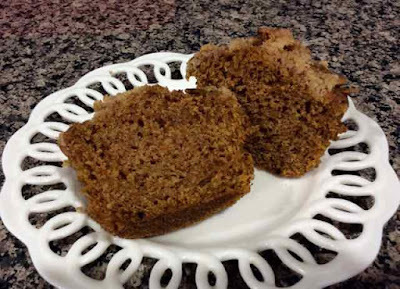 The texture of cakes comes out fluffier, moister and more wheat like. Cookies get a more tender crumb. Bread is fluffier too. This recipe is a keeper. The wheat version came from SallysBakingAddiction blog. I think that the recipes on this blog are delicious and come out very well. A good recipe is the best recipe to start with when converting it into a gluten free one. I hope you enjoy these muffins as much as I did. 1) All of the ingredients should be at room temperature before you start. 2) Preheat the oven to 425℉. The rack should be in the center of the oven. 3) Prepare 2 muffin pans by lining them with paper cupcake liners. Set aside. 4) In a large bowl add the flours, spices, salt, xanthan gum and baking powder. Mix well and set aside. 5) In a medium bowl add the sugars, oil, squash, eggs and milk of choice and mix well. 6) Pour the wet ingredients into the bowl with the dry ingredients. Fold gently until just combined and no clumps of unmixed flour remain. 7) Scoop the batter into the paper liners, filling them until almost full. 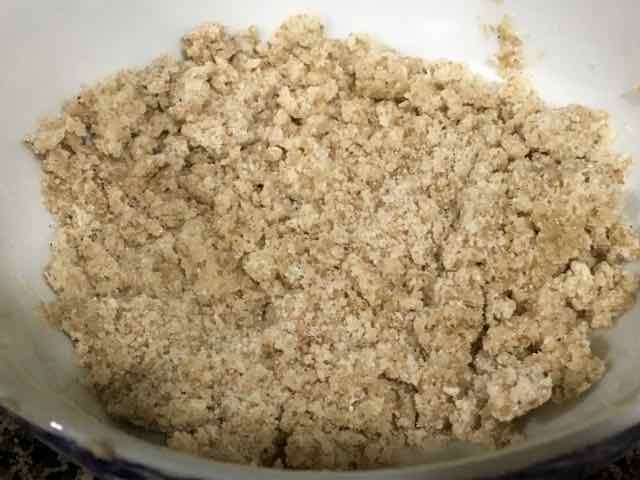 8) Make the topping by adding the flours, sugars and spices to a small bowl and mixing well. Add the melted butter or oil and stir until combined. The butter will form crumbs the oil will make a paste. Crumbs made with melted butter. The crumbs made with oil was like a paste. 9) Sprinkle the crumbs over the tops of the muffins. If using oil ‘crumbs’ break them up and drop them as evenly as you can over the muffin batter. The oil crumbs will melt over the tops, the butter crumbs will stay crumbly after baking. Muffins with butter crumbs and pumpkin seeds on top before baking. 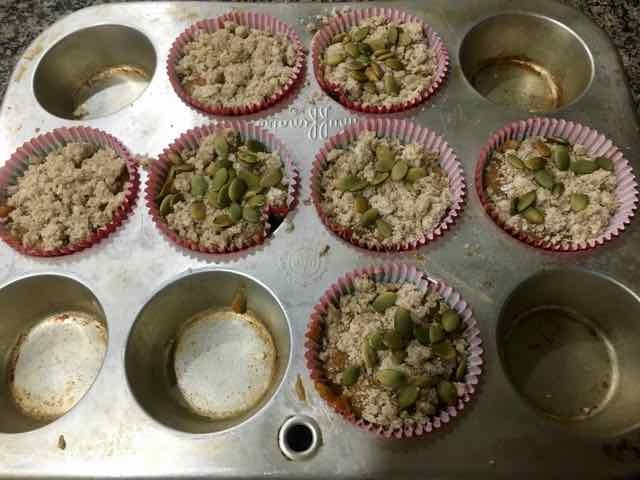 Muffins with dairy free oil crumbs and pumpkin seeds on top before baking. 11)Bake for 8 minutes at 425℉ then lower the oven to 350℉ and bake another 14 minutes or until done. The center will spring back when gently pressed or a toothpick will come out clean when done. 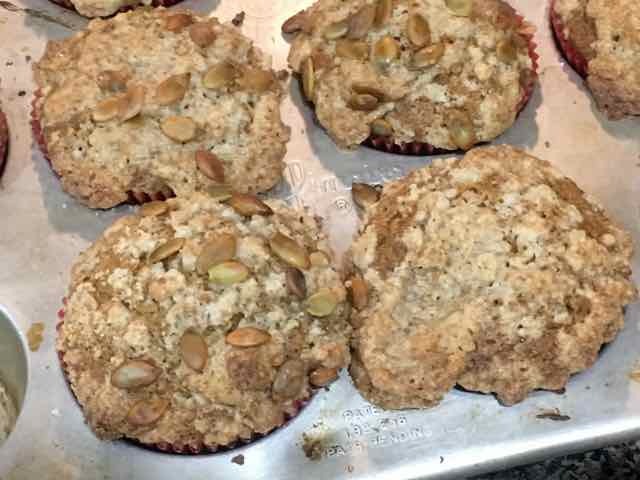 Baked muffins with oil crumb topping. GLUTEN FREE BUTTERNUT SQUASH CRUMB CAKE MUFFINS Makes about 14 muffins INGREDIENTS Cake 1 cup Sorghum Flour ½ cup Tapioca Flour 2 Tbs. Chickpea/Garbanzo Flour 2 Tbs. Coconut Flour 1 ½ tsp. Baking Powder ¾ tsp. Xanthan Gum ⅜ tsp. Himalayan Sea Salt 2 tsp. Cinnamon ¼ tsp. Ground Ginger ¼ tsp. Nutmeg ¼ tsp. Cloves ¼ tsp. Allspice ½ cup Oil - light flavored such as Sunflower or Canola ½ cup Sugar ½ cup Brown Sugar 1 ½ cups (340g) Butternut Squash Puree (or Canned Pumpkin, I think sweet potato would also work) 2 large Eggs ¼ cup Milk - for Dairy Free use non dairy milk of choice I used almond Crumb Topping ½ cup Sorghum Flour ¼ cup Tapioca Flour ¼ cup Sugar ¼ cup Brown Sugar ¼ tsp. Ground Ginger ¼ tsp. Nutmeg ¼ tsp. Cloves ¼ tsp. Allspice 6 Tbs. 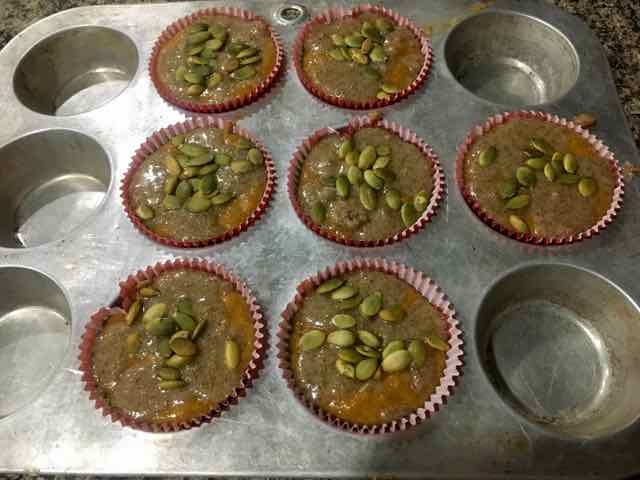 Melted Unsalted Butter or for Dairy Free use a light flavored Oil such as sunflower or canola ⅓ cup (optional) Lightly Toasted Pumpkin Seeds DIRECTIONS 1) All of the ingredients should be at room temperature before you start. 2) Preheat the oven to 425℉. The rack should be in the center of the oven. 3) Prepare 2 muffin pans by lining them with paper cupcake liners. Set aside. 4) In a large bowl add the flours, spices, salt, xanthan gum and baking powder. Mix well and set aside. 5) In a medium bowl add the sugars, oil, squash, eggs and milk of choice and mix well. 6) Pour the wet ingredients into the bowl with the dry ingredients. Fold gently until just combined and no clumps of unmixed flour remain. 7) Scoop the batter into the paper liners, filling them until almost full. 8) Make the topping by adding the flours, sugars and spices to a small bowl and mixing well. Add the melted butter or oil and stir until combined. The butter will form crumbs the oil will make a paste. 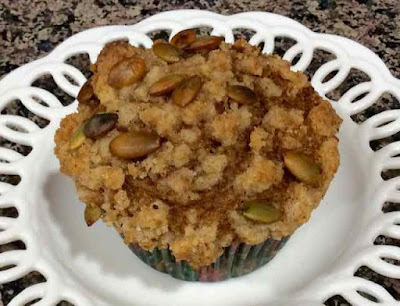 9) Sprinkle the crumbs over the tops of the muffins. If using oil ‘crumbs’ break them up and drop them as evenly as you can over the muffin batter. The oil crumbs will melt over the tops, the butter crumbs will stay crumbly after baking. 10) Sprinkle the tops with some toasted pumpkin seeds, if desired. (To toast pumpkin seeds spread them out on a baking sheet and heat them in the oven at 350℉ for 3-5 minutes, watching closely so that they do not burn or get too brown.) 11) Bake for 8 minutes at 425℉ then lower the oven to 350℉ and bake another 14 minutes or until done. The center will spring back when gently pressed or a toothpick will come out clean when done.